Why Seed Origin Matters: Any Seed Will Do? Those of you who are purchasing or planning to purchase native plant seed for upcoming fall and dormant season plantings and spring season plantings, it is important to buy seed containing genetic origins from the ecoregion or adjacent ecoregion(s) in which you will be planting. The use of seed with unknown origins (i.e. non-cultivar seed, non-certified seed) often results in poor planting success. Some government agencies like the Texas Department of Transportation (TxDOT) have abandoned the specification and use of non-cultivar seed within their work regions due to past planting failures. For example, in South Texas due to such planting deficiencies and concerns about highly invasive Old World Bluestems (Bothriochloa spp., Dicanthium spp.) and Buffelgrass (Pennisetum ciliare), TxDOT seeding specifications exclusively specify the use of certified native seed sold under the South Texas Natives name. While some exotics still remain on the planting list, that is simply a limitation of the native seed market (i.e. lack of certified, ecotypically appropriate seed sources, demand exceeding supply, etc.). Additionally, as an organization partially funded by the federal government, TxDOT is bound to the Clean Water Act. Elaborating, Smith (2010) states, “As a result of federal Clean Water Act provisions designed to prevent soil erosion, the giant buyer of the grass seed market, the Texas Department of Transportation (TxDOT), is forced to plant exotics at the completion of a highway project if native seed is not immediately available in the necessary quantities”. In Texas, demand for native plant seed exceeds annual production capacities, and TxDOT is a large driver of native seed demand. Commercial seed market limitations aside, private consumers can help to turn the tide of seed demand in favor of certified native seed, simply by not asking for or using any exotic seed, thereby increasing production of native species. Just because seed is cheap does not mean you should use it. Cheap seed is junk and often results in poor planting performance. Some native seed on the market is listed as “Variety Not Specified”, or “VNS” (also listed as “Common”). These types of seed are often of unknown origin(s) and therefore have not been proven for successful use in restoration or reclamation seeding work. For example, though “VNS” Blue Grama may be the cheapest seed of that species available to you from your favorite seed dealer, it is highly advisable to not buy it for several reasons, as listed below. “VNS” seed is non-certified, meaning certain amounts of weed seed are permitted by law to be included in the bag of any “VNS” seed you buy (permissible levels vary from state to state). In Texas, permissible weed seed is listed as “Other” or “Other crop seed”, and generally such seed is KR Bluestem (Bothriochloa ischaemum) or other exotics. To avoid this pitfall, ALWAYS purchase certified seed or carefully collect your own. “VNS” seed has unknown origin(s). This presents many problems when used in plantings. The most glaring problem is planting failure within 1-3 years, due to poor plant performance (i.e., rapid establishment, vigor, and flowering and seed production). The money spent on VNS seed is wasted. “VNS” seed is often sold, traded, or otherwise has changed hands many times and across many locations within the commercial seed trade. Its genetic origin(s) and genetic purity are lost as a result. In the end, “VNS” is junk seed, regardless of species nativity. On a related note, beware of native seed sources that are listed as”Native” or “Native ecotype” or “Local ecotype”, or even promoted as “wild harvests” that are not source-identified per state agriculture regulations. These sources of seed pose the same cleanliness concerns as uncertified seed, as well as unproven performance and unproven restoration uses. Additionally, “Native” and “Local ecotype” are not legally recognized varieties. In fact, many native seed cultivars (i.e. ‘Haskell’ Sideoats Grama, ‘Lovington’ Blue Grama, ‘Kaw’ Big Bluestem, etc.) are bought and repackaged by some seed dealers and sold as part of native “wild harvests”! While such a practice is unscrupulous, it goes to show how much more reliable commercial cultivars are, and how limited in practicality and scope the wild harvest model is beyond the scale of backyard hobbyist plantings. Further, “native” and “local ecotype” are relative terms, and it is incorrect to assume that a seed company selling seed advertised as such has harvested or grown it locally with respect to their physical location. Many seed dealers don’t even grow their own seed. They purchase bulk “wild harvests” and screen and sort and package seeds under their own brand(s). Additionally, seed that is not sold as Selected Texas Native Germplasm (green tag) or Source Identified Texas Native Germplasm (yellow tag) has not been grown in Texas (Texas Administrative Code, 2007). The more demand consumers can create for high-quality certified commercial native seed sources, the better the results restoration plantings across the state will show. In the end, any seed will not simply do. 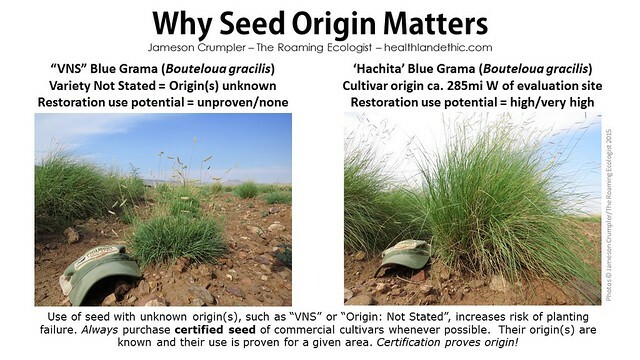 Below is a visual showing the differences in 2 years of growth between a Blue Grama plant of unknown origin (labeled as VNS, but the same concept applies to “wild harvest”, “local ecotype”, etc.) vs. a commercial cultivar with known origin, soil information, and ecological site data. Both plants are growing less than 20ft. apart, on the same soil, were planted at the same time, and received the same amount of irrigation during the establishment period. Smith, F.S. 2010. Texas today: A sea of the wrong grasses. Ecological Restoration. 28(2): 112-117. Texas Administrative Code. 2007. Title 4, Agriculture. Part 1. Texas Department of Agriculture. Chapter 10, Native Plant Materials, Sec. 10.31. Texas Department of Transportation. [website]. URL: http://ftp.dot.state.tx.us/pub/txdot-info/des/specs/items-164-seed-tables.pdf Accessed 9/1/15. Tagged commercial seed cultivars, commercial seed market, commercial seed sources texas, grass seed, issues with native seed, local ecotype seed, native seed, native seeds Texas, prairie roadsides, prairie roadsides Texas, prairie seed, seed source, TxDOT roadside seeding, VNS seed, why seed origin matters.